Li Liu was born in the city of Shenyang which is located in Liaoning Province in The Northeast of China. When she was six years old she began her acrobatic training, and the following year she was chosen to attend The Chinese National Circus School in the capitol city of Beijing. While in Beijing she trained for eight hours a day until the age of 16. During the evening she was required to study math, science, the reading and writing of Chinese characters, and other academic subjects. In 1984 her artistic cycling act won a gold medal at the prestigious Festival Mondial du Cirque de Demain in Paris, France. She often teamed with her sister Liu Ying to create duo acts that were conceived of and coached by her father Liu Gui Ting. In 1995 their duo hand balancing act was selected to perform at The Wu Qiao International Circus Festival where they were awarded “The Golden Lion” prize. 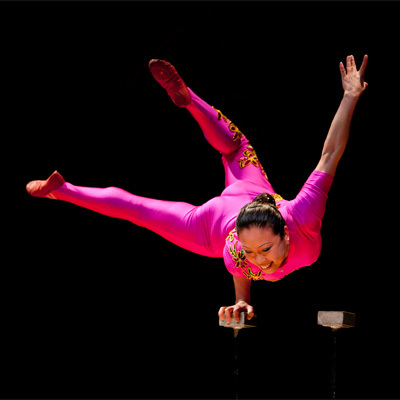 For many years Ms. Liu traveled extensively throughout Europe, Africa and Asia with The Liao Ning Acrobatic Arts Troupe. She performed with Zirkus Knie in Switzerland, Circus Krone in Germany and with countless other touring shows in Italy, Holland, France, South Africa, Singapore, Japan and Indonesia. She came to the United States in 2000 with Ringling Brothers Barnum & Bailey Circus and toured all over the US for two years. She has been living in the US and working as a freelance performer since 2002. She is a regular on the NBA & WNBA half-time circuits and is also is a featured performer on Princess Cruise Lines. Li began performing in schools in 2005, at first collaborating with other circus artists, and eventually developing her own solo show. The performance includes hand balancing, plate spinning, trick cycling, foot juggling, ribbon dancing and Chinese water bowl manipulation. Li also touches on various aspects of Chinese language, geography and culture while sharing her work and travel experiences with the students and staff. Her show is primarily geared toward elementary school audiences (grades K-6). Students get a hands-on shot at trying some of the easier (and safer!) skills such as ribbon dancing and basic plate spinning. They learn the historical significance of traditional lion and dragon dances and are encouraged to think about what it might have been like to grow up in a different time and place. Total Execution Time: 1.7 sec.